No new fabric was purchased this week, and the Star Wars quilt was completed, so I’m really moving into the black. This will be the last Report for a few weeks because I’ll be away from my machine while traveling. That means no fabric usage, and possibly some buying! Good luck to you in using your stash! I’m linking up to the Stash Report at Patchwork Times. 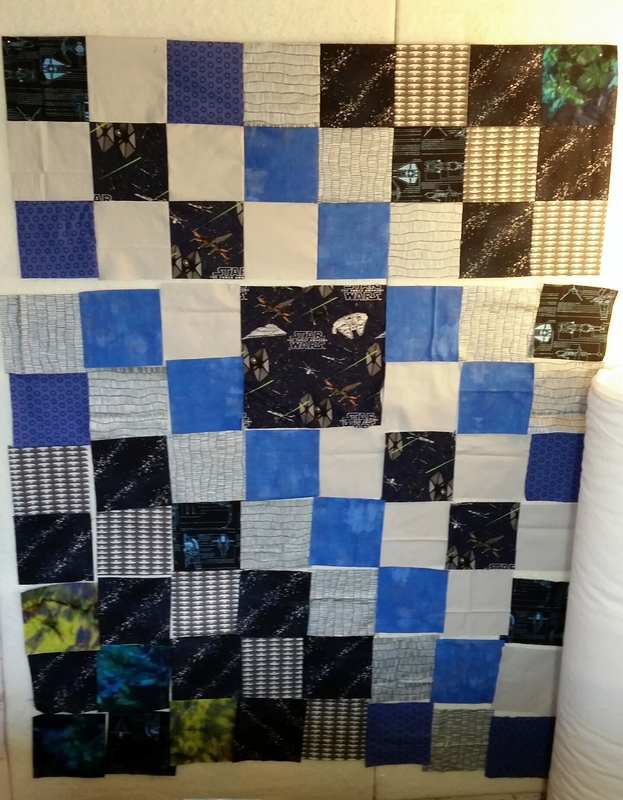 The Star Wars donation quilt is all finished and washed up. I’ll take photos of it as soon as this wind dies down. We didn’t get the snow (just a covering), but we did get the cold and the high winds. 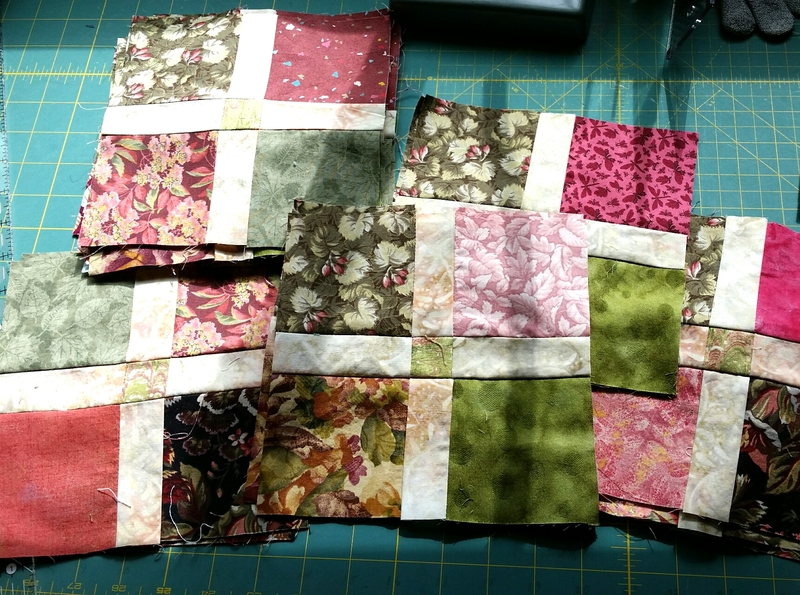 Today I started on Clue 3 of the Surrounded by Scraps mystery quilt. I made all twenty of these units, but there a couple more steps for the next few days. Hope you’re sewing every day this month for March-A-Long, and making lots of progress! 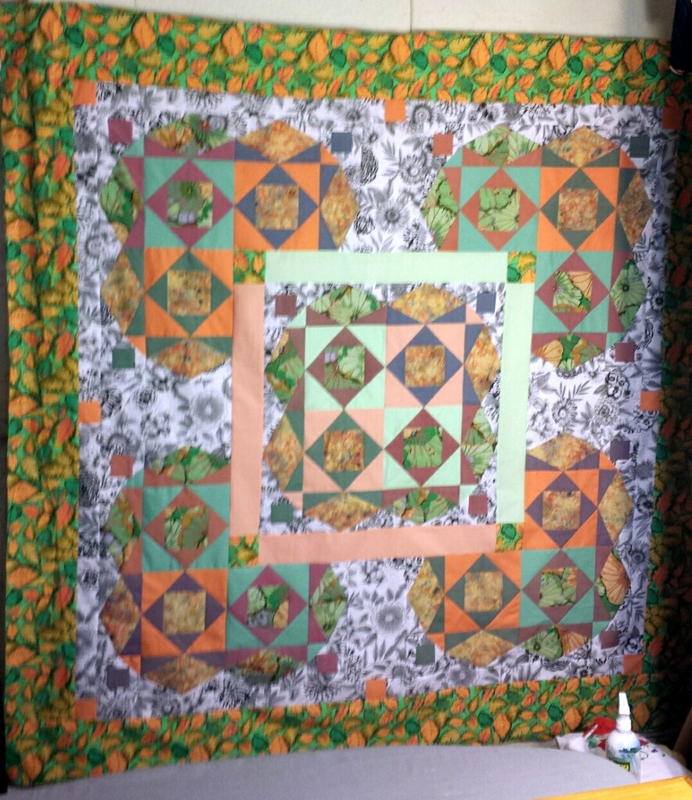 In the two weeks since my last report, I finished the Orange Cabin-ish Quilt for 4.75 yards, and two sets of donation blocks that totaled 3.75 yards. 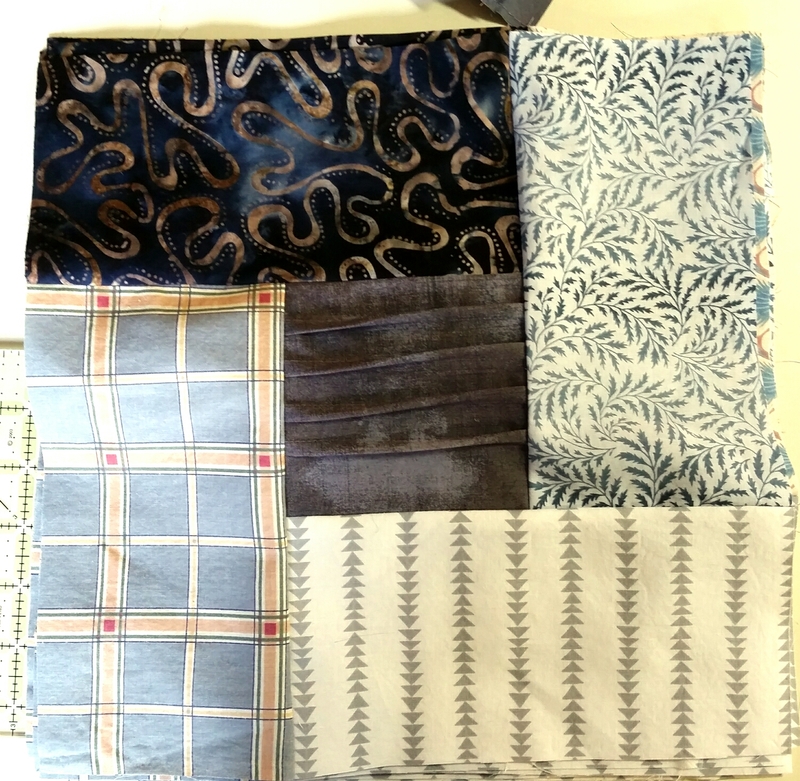 And no fabric was purchased! Yesterday it was cold here, but nice and bright, and I was alone all day, so lots of sewing happened! While I was cleaning out and refolding some fabric drawers, I came across the scraps from a couple of Star Wars quilts. The 10.5″ square was already cut, and so were many of the 6.5″ squares. 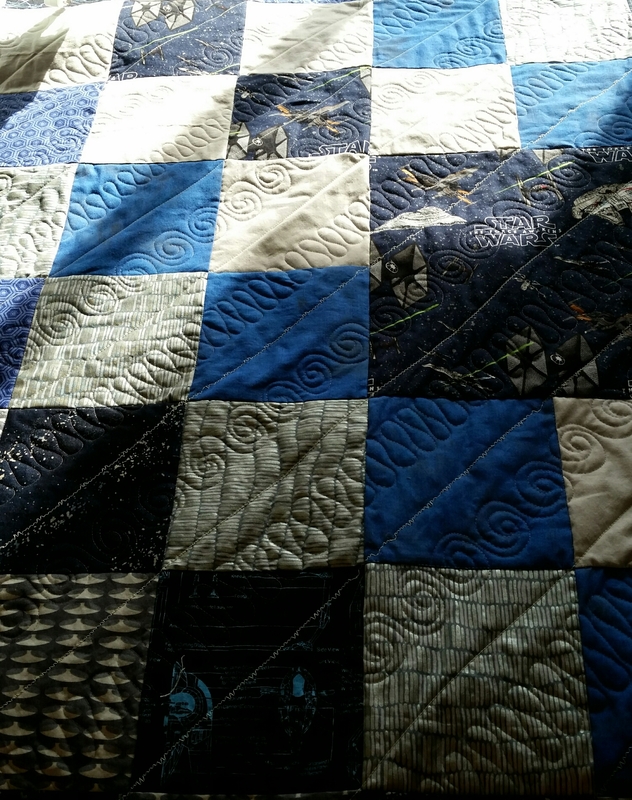 I decided to use them up by making a quilt to donate. Shouldn’t take long to get the rest of it together. Hope you’re all safe from the severe weather going on. 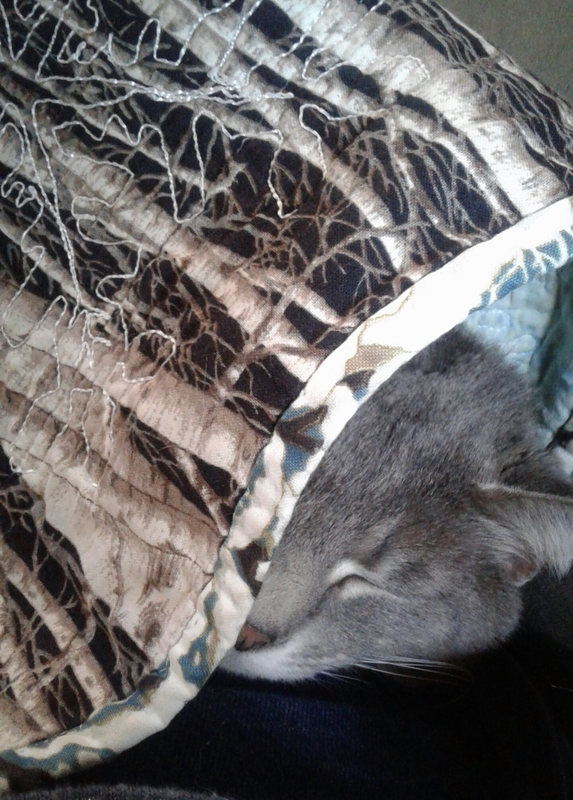 Some of us are cozier than others! Doing some staring and thinking about a direction for this top. I will probably do some kind of cropping on the corners. So far I’ve observed March-A-Long by doing something in my studio every day. I made donation blocks, cut my scraps, packaged some blocks and quilts to mail, stared at my Storm at Sea top, and, yesterday and today, made some more heart blocks for HollyAnne. March is one of those in-between months when progress can stall if we don’t make an effort. My January was super productive, February not bad, but other things are starting to take my attention now, so we really need March-A-Long. Darla has recorded some inspiration here. 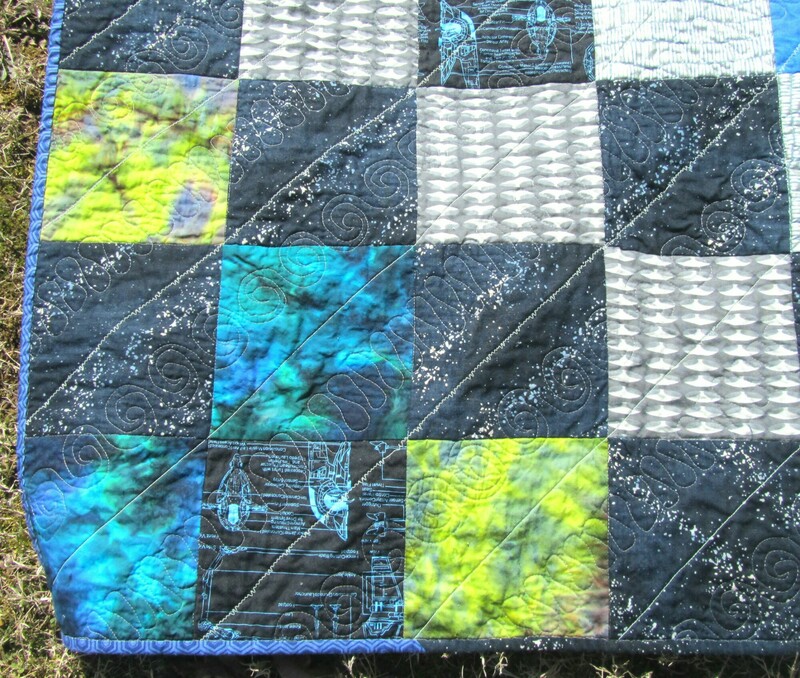 I’m linking up March-A-Long at The scientific Quilter.